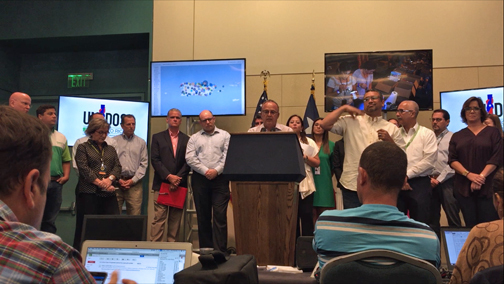 Aurelio Alemán, at podium, discusses the achievements of the United for Puerto Rico effort thus far. United for Puerto Rico has raised more than $10 million and collected more than 800,000 in provisions three weeks after becoming a a private nonprofit organization, said Aurelio Alemán, board chair of the group. Established after Hurricane Irma struck Puerto Rico early last month, the group decided to strengthen itself by obtaining its NGO status from the Puerto Rico Treasury Department and a 501(c)3 certification from the Internal Revenue Service. The Office of the First Lady of Puerto Rico originally conceived the initiative as a telethon to help Hurricane Irma victims. But after María struck, the private sector came together, adopted and organized the cause, First Lady Beatriz Rosselló said. The goal is to aid individuals and small businesses devastated by Hurricanes Irma and María to accelerate in their recovery by helping meet housing, food and health needs, facilitating that they may rebuild their lives, communities and Puerto Rico. As part of this effort, the organization will focus on the immediate needs of those who lost their homes and belongings, particularly among the elderly, children, single mother households, the homeless and the disabled. So far, United for Puerto Rico has coordinated the arrival and distribution of donated goods, including the registry and sorting of more than 800,000 pounds of food, clothing and other articles of first necessity. These have been consigned to the Treasury Department and have been distributed to aid centers and shelters throughout the island, reaching all municipalities, Alemán said. As part of this effort, Evertec & Microsoft have supported the operation with technology capabilities and Suiza Dairy, Rooms to Go and the National Guard have participated in the collection and distribution of goods. The group also executed a media plan to publicize the effort, providing several channels through which to donate funds, through deposits or transfer of funds to the account created at First Bank and the use of credit cards, ATH Móvil and PayPal. “As a result of this plan, the response has been significant. The organization has surpassed all expectations in a short period of time,” Alemán said. “As of today, more than 125,000 transactions have been processed for an average of $87 to reach $11 million. These contributions have been received not only from Puerto Rico but from all over the world, including the U.S., Canada, Great Britain, Spain, and Mexico,” he said. “We want to thank everyone, the community based organizations, all the people, entities and teams who have made it possible so far for United for Puerto Rico to benefit those most in need. We are convinced that to overcome our crisis we will need to join forces, work together in teams and collaborate, “said Aleman. Private sector companies participating in the effort are: Bacardí Corporation; Banco Popular Foundation; Bella Group; Burger King; Coca-Cola; Empresas Fonalledas (Plaza Las Américas); Evertec; FirstBank; GFR Media; MMM; Sarco (Church’s); Toyota; Triple-S; Walgreens; and Walmart. “We want to recognize these private sector leaders for responding decidedly and unconditionally with economic support from day one,” Alemán said. “We acknowledge the First Lady and her staff for their tireless work and for founding his initiative, which three weeks later has surpassed expectations given the circumstances of Puerto Rico,” he added. Provide immediate aid to those with the greatest needs with the goal of meeting their basic needs of housing, food and health in coordination with institutions and FEMA and complementing the efforts of these and federal benefits available through FEMA. Collaborate with NGOs dedicated to serve the key groups identified in our mission since these entities have the structure, experience and capacity to be more efficient in this endeavor. Assist small businesses in communities with financial aid to help them resume operations. Provide information on available federal assistance programs to the public in general and facilitate that the greatest number of individuals who qualify for aid programs apply for available aid to leverage all the help that can be garnered for those most in need. United for Puerto Rico will continue with its fundraising efforts to increase its community impact. One of the initiatives with greater visibility is the organization of a Telethon to be held Nov. 19, 2017 that is to be transmitted by Wapa, Telemundo, Univision and Channel 6. Hey Buddy!, I found this information for you: "United for PR raises M+, 800K lbs in provisions". Here is the website link: https://newsismybusiness.com/united-raises-provisions/. Thank you.